China’s first aircraft carrier has entered into service, the defence ministry says. The 300m (990ft) Liaoning – named after the province where it was refitted – is a refurbished Soviet ship purchased from Ukraine. For now the carrier has no operational aircraft and will be used for training. But China says the vessel, which has undergone extensive sea trials, will increase its capacity to defend state interests. The commissioning of China’s first aircraft carrier – the Liaoning (a former Soviet vessel, the Varyag) – sends a signal to other countries in the region that Beijing’s maritime ambitions are growing. The fact that this comes at a time of heightened tensions in the East China Sea only underlines the message. But China’s new carrier is more a symbol of a future capability than a potent naval threat itself. The delivery of the aircraft carrier comes at a time when Japan and other countries in the region have expressed concern at China’s growing naval strength. China and Japan are embroiled in a row over disputed islands in the East China Sea.Several South-east Asian nations are also at odds with China over overlapping territorial claims in the South China Sea. It also comes weeks ahead of a party congress expected to see the transition of power to a new generation of Chinese leaders. The country’s Communist leaders are spending billions modernising their armed forces so they can project military power far beyond China’s borders. The Liaoning, formerly known as the Varyag, was constructed in the 1980s for the Soviet navy but was never completed. When the Soviet Union collapsed in 1991, the Varyag sat in Ukraine’s dockyards. A Chinese company with links to China’s People’s Liberation Army (PLA) bought the ship just as Soviet warships were being cut for scrap. It said it wanted to turn the Varyag into a floating casino in Macau and in 2001 the ship was towed to China. 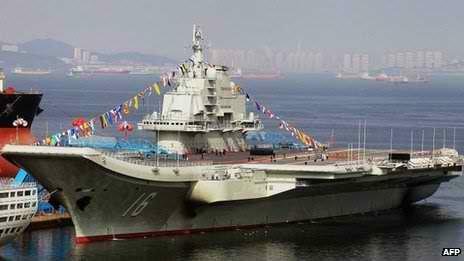 The Chinese military confirmed in June 2011 that it was being refitted to serve as the nation’s first aircraft carrier. Analysts say it will take years to outfit the carrier with aircraft and make it fully operational. But Chinese officials say that the Liaoning advances the country’s military modernisation. The carrier will be mostly used “for scientific research and training missions” so China could build “a more advanced aircraft carrier platform in the future”, he added. Aircraft carriers are a representation of a nation’s power. China is a military power that will threaten to change the world’s geopolitical balance—another problem for America to worry about. Iran is attacking computer systems in the U.S. —Leon Panetta, U.S. Secretary of Defense implied such. He went on to say that America was at risk of a “cyber-Pearl Harbor”. Mr. Panetta said the attacks were probably the most devastating to ever hit the private sector. In Saudi Arabia, more than 30,000 computers were paralyzed by the attack on the Saudi state oil company ARAMCO. Ras Gas was impacted in Qatar. It is believed that Iran was behind these attacks. Understand that Saudi Arabia fears an Iran that may go nuclear—the two are long time rivals in the Middle East. Without a doubt there is a cyber-war that is escalating between the U.S. and Iran (and Israel). Iran believes America and Israel were responsible for the destructive virus Stuxnet that caused serious damage at Iran’s nuclear plants in Natanz and Bushehr. A war between America and Iran has been in play for some months now—a cyber war. Without question it can be said that tensions are rising, not diminishing. Wars & rumors of war (Matthew 24:6), applies here; it looks like we are getting closer to an eventual war: will that war take place; we wait and watch.